This conversation on football themed party tips is sponsored by BabbleBoxx.com. All opinions are my own. 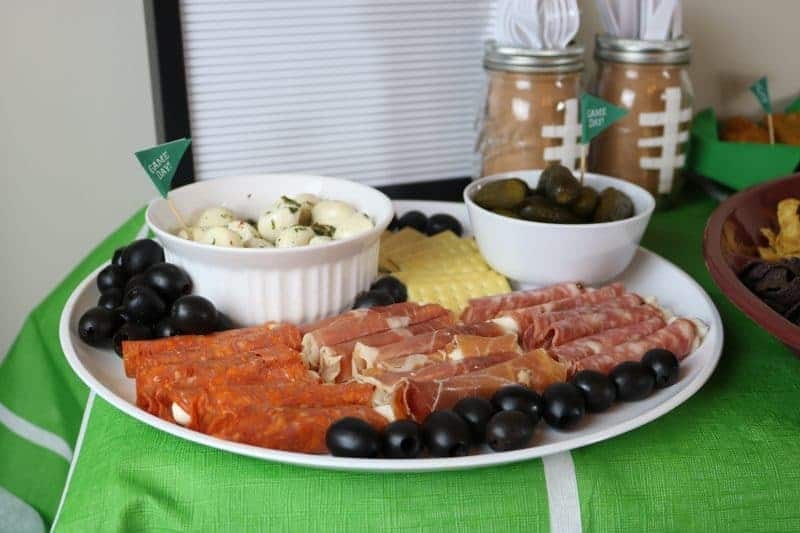 With the Big Game right around the corner, I wanted to share this fun and easy football themed party spread. 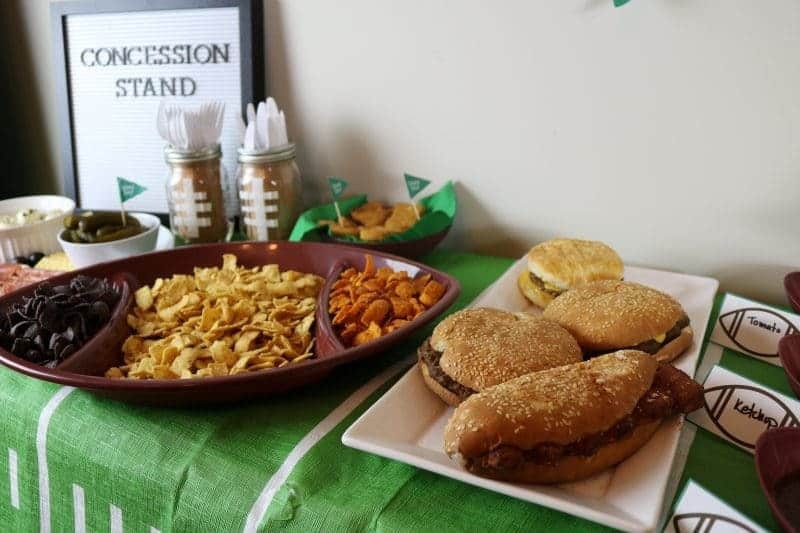 I focused on putting together a party spread that is fun, easy, and perfect for the Big Game. 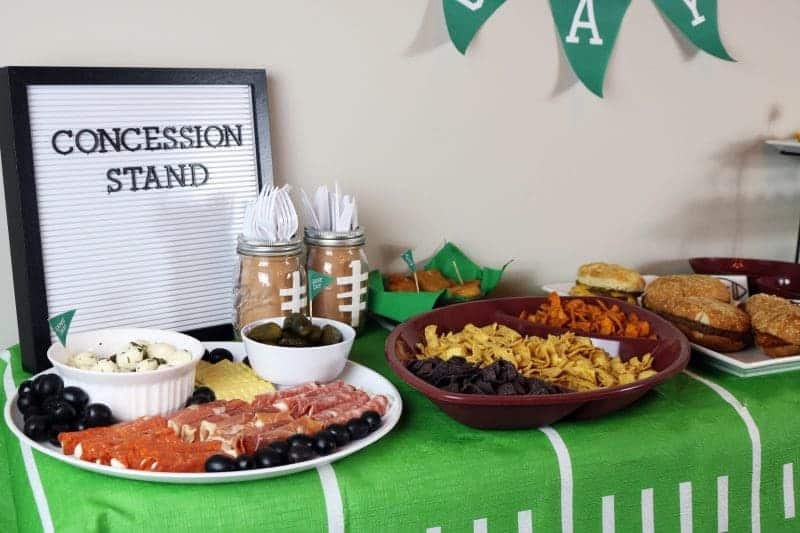 One of the keys to a successful Big Game party is a great spread of snacks and finger foods for munching on while watching the game. For our party spread I choose to serve several tasty hot appetizers paired with sauces for dipping, hot sandwiches, a chartreuse board with savory cheeses, and chips for snacking. 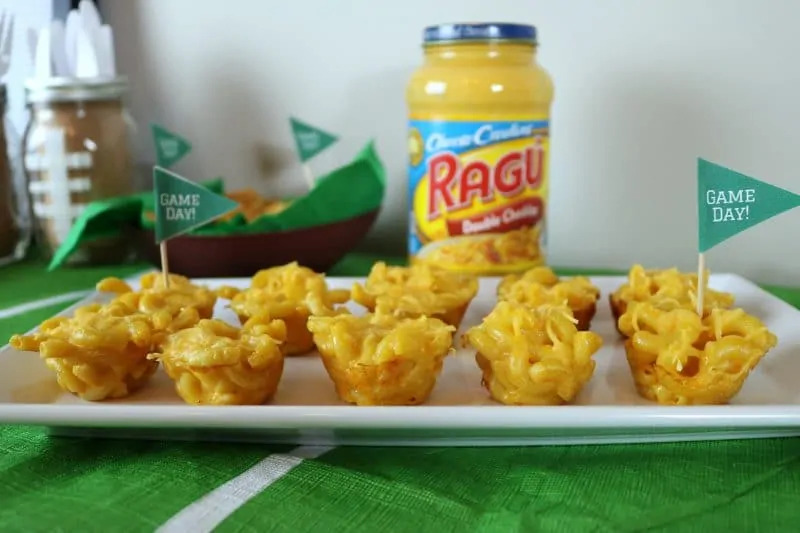 Read on for a recipe for my yummy mini mac & cheese cups which will make a perfect addition to your Game Day spread. …all available for free download below. These cheesy bite sized cups are sure to be a hit at your football themed party. Not only are they super easy to make, but they are also perfect for fixing up ahead of time and simply warming up before serving on the day of the Big Game. 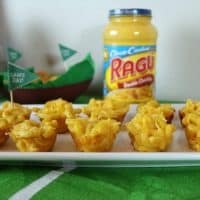 RAGÚ® Double Cheddar Sauce, featuring Cheddar, Parmesan, and Romano Cheeses, is the perfect sauce for macaroni & cheese, and proved to be the perfect sauce for these tasty mac & cheese cups as well. A printable recipe card is included at the bottom of this post for your convenience. 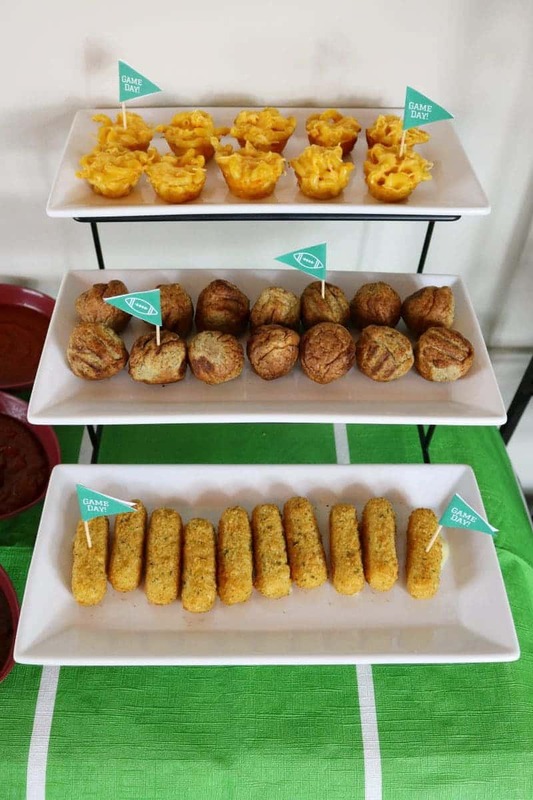 In addition to mini mac & cheese cups, my game day party spread also included cocktail meatballs, mozzarella sticks, chicken nuggets, as well as several options for dipping. 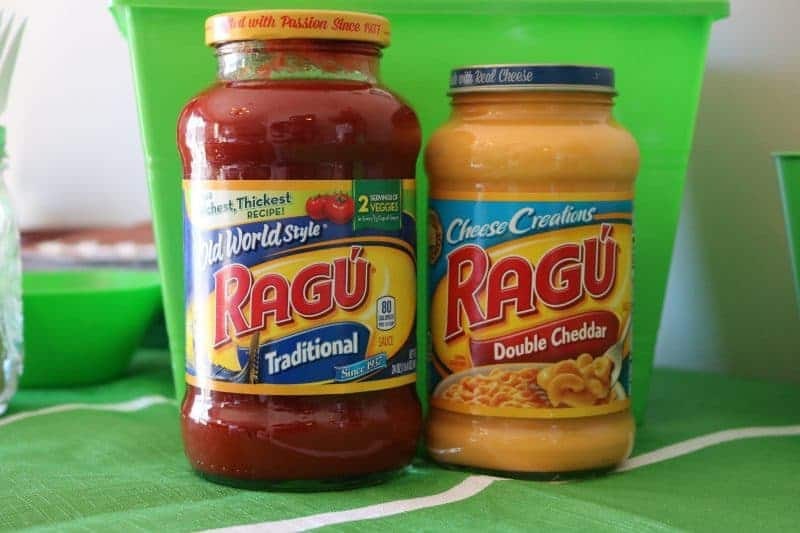 RAGÚ® Old World Style Traditional Sauce proved to be a great dipping option. While smooth and flavorful RAGÚ® sauce is perfect for serving over pasta, it is also great for dipping hot appetizers in such as mozzarella sticks and cocktail meatballs. Plus, I love that RAGÚ® Old World Style Traditional Sauce contains 2 servings of vegetables in every 1/2 cup serving! For snacking I chose to serve up Garden of Eatin’® Chips. These high quality organic corn chips are made with NON-GMO ingredients and are the perfect better-for-you snack. 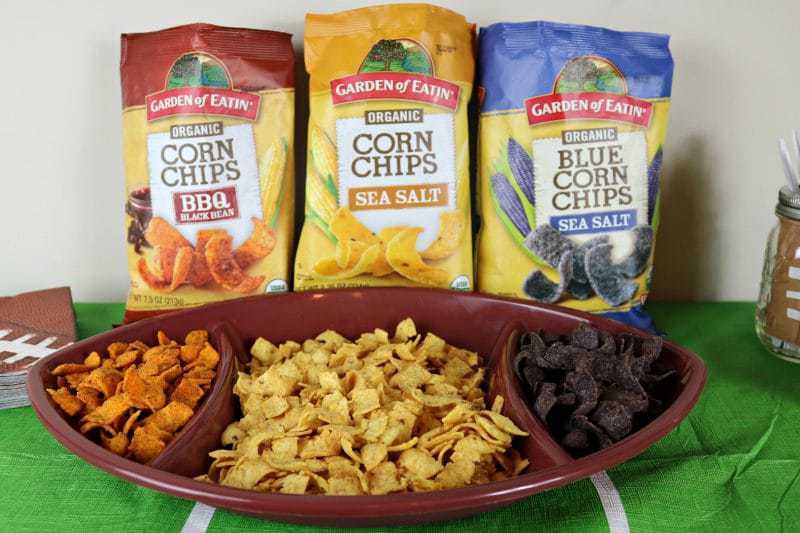 The chips come in 3 tasty flavors: Corn Chips with Sea Salt, Corn Chips BBQ Black Bean, and Blue Corn Chips with Sea Salt. The BBQ Black Bean variety is my personal favorite, as I love the zesty BBQ flavor. Get a downloadable coupon for $0.75 off any variety of Garden of Eatin’® Organic Corn Chips here. As I mentioned earlier, I wanted to offer my guests several sauce options for dipping. In addition to placing out a bowl of tomato sauce, I also included bowls of delicious Smoky Ketchup and Applewood Smoked Molasses BBQ Sauce from Red Duck Foods. Red Duck Foods Smoky Ketchup is a high-quality ketchup that actually tastes like tomatoes. It's great for everything from cooking (makes a killer chili) to topping burgers and dipping fries. Your guests will enjoy dipping their chicken nuggets and mac and cheese cups in the ketchup, as well as using it to top their burgers. Red Duck Foods Smoked Applewood Molasses, made with whole ingredients and without artificial coloring or preservatives, is a delicious BBQ sauce that pairs well with everything from chicken nuggets to meatloaf. It is the perfect mix of sweet and savory, and I can't get enough of it! Use code BABBLEBOXX for 25% off your Red Duck Foods purchase here (valid through 2/28/2018). 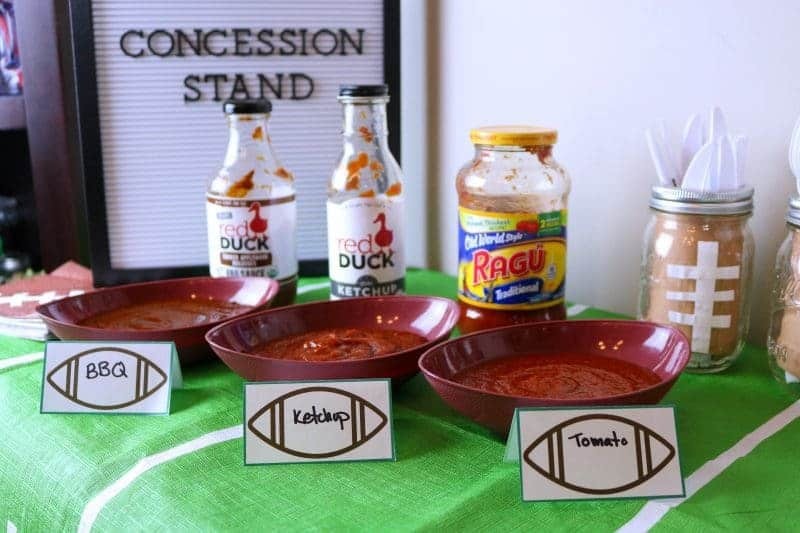 To make it easy for my guests to determine which sauce is which, I placed out a few buffet table food labels that I designed especially for our Big Game party. These fun football themed labels are perfect for game day party spreads. 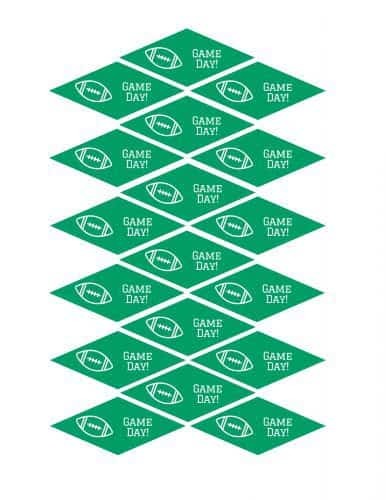 Download these football game day labels here. 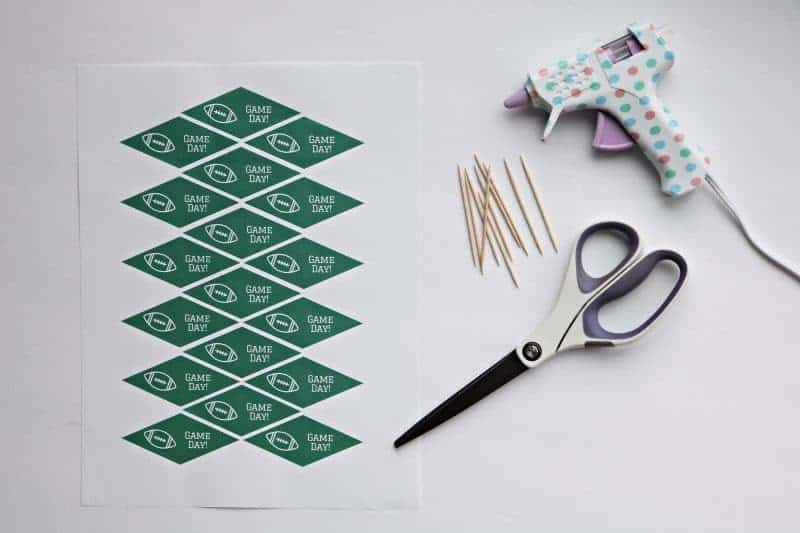 Then, simply cut them out, fill in the label, and fold each along the middle so that they will stand upright. 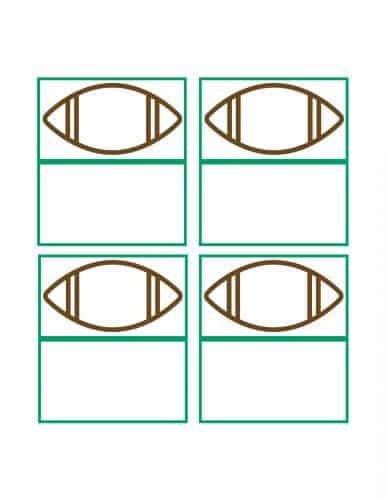 These football labels are also great to use as place cards if you wanted to have a sit down football-themed dinner. 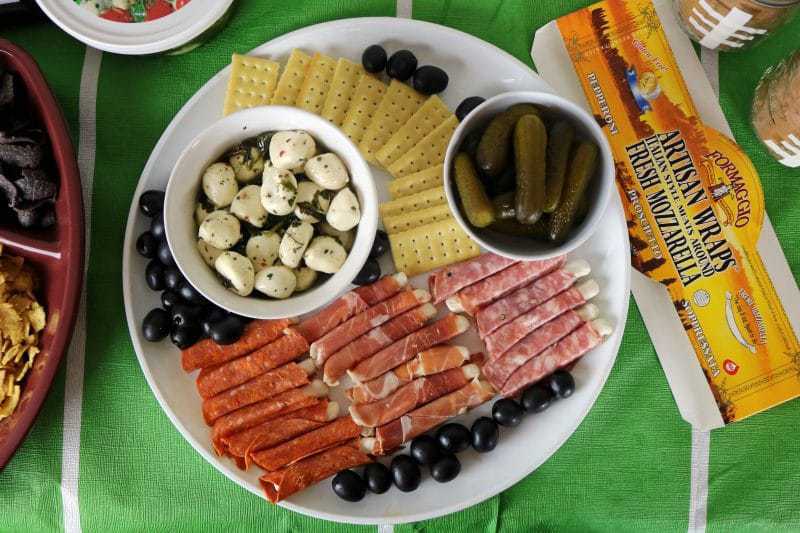 For our Big Game bash I prepared a charcuterie board featuring savory Formaggio Italian Cheeses, crackers, olives, and gherkin pickles. Formaggio's Fresh Marinated Mozzarella Salad Cup features their award winning fresh hand stretched mozzarella tossed in a delicious marinade of herbs and spices. Their Artisan Wraps are perfect for snacking and feature Italian style meats wrapped around their fresh and creamy mozzarella. Formaggio products are seriously just perfect for party spreads! You can find them at Sam's Club and Costco. Air Fried for the Win! When it comes to guilt-free fried foods, the new Midea Air Fryer is sure to be a game changer. 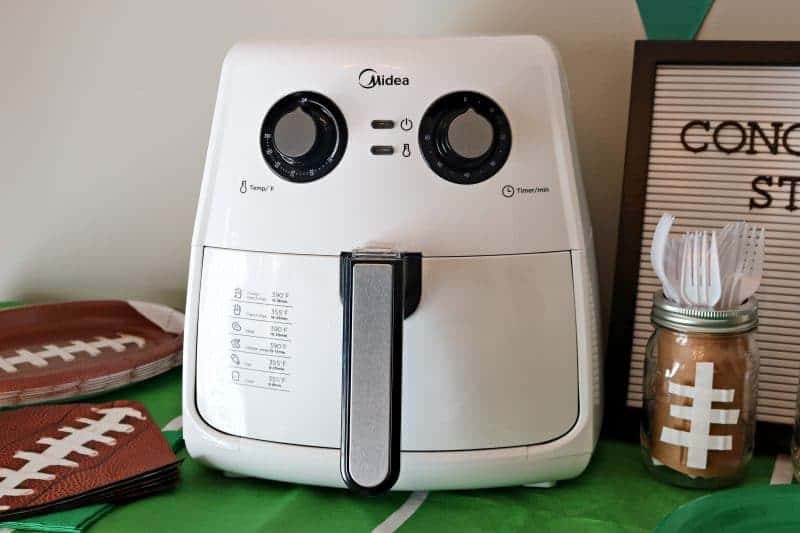 By cooking foods with 1500 watts of circulating super-heated air, the Midea Air Fryer provides classic friend foods with the same look and crisp taste that we love, while seriously cutting down on their fat content. This means fried foods with less fat, yet the same great and crispy taste. To be honest, I think foods prepared in the air fryer taste even better than those prepared in a traditional deep dryer! Plus, your fingers don't get all greasy! 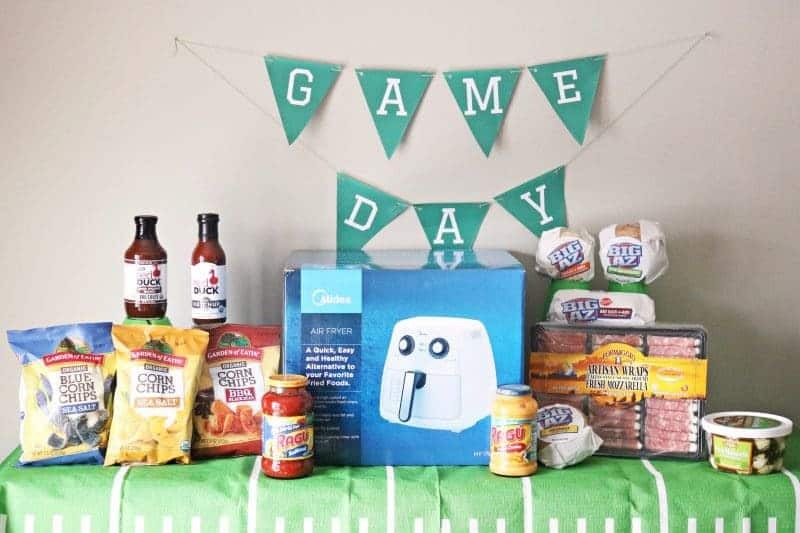 Not only does Midea’s new MFTN3501 Air Fryer fry foods, but it can also bake, roasts, and grill, making it a great all-in-one device for your game day – and everyday – needs. 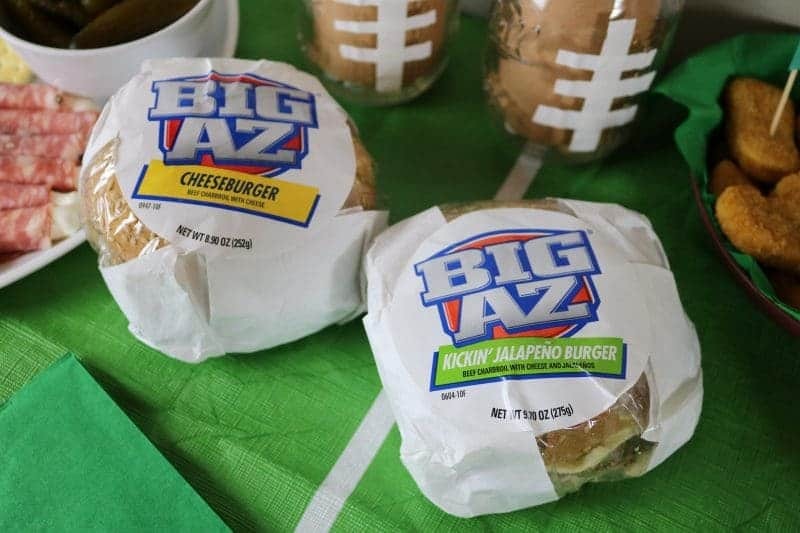 For those with a heartier appetite I included a couple of varieties of BIG AZ® Sandwiches in my game day spread. I love how convenient and inexpensive BIG AZ® Sandwiches are, and that they never fail at satisfying my appetite. My absolute favorite BIG AZ® sandwich is the 2X Sausage and Cheese Breakfast sandwich. With double sausage patties, double slices of cheese, all sitting on a buttery biscuit, it is seriously the king of all breakfast sandwiches. To be honest, I would eat this protein-packed sandwich anytime of day – not just in the morning! It is so filling and such a great value. BIG AZ® sandwiches are available in convenience stores nationwide in 9 lunch and 4 breakfast varieties. 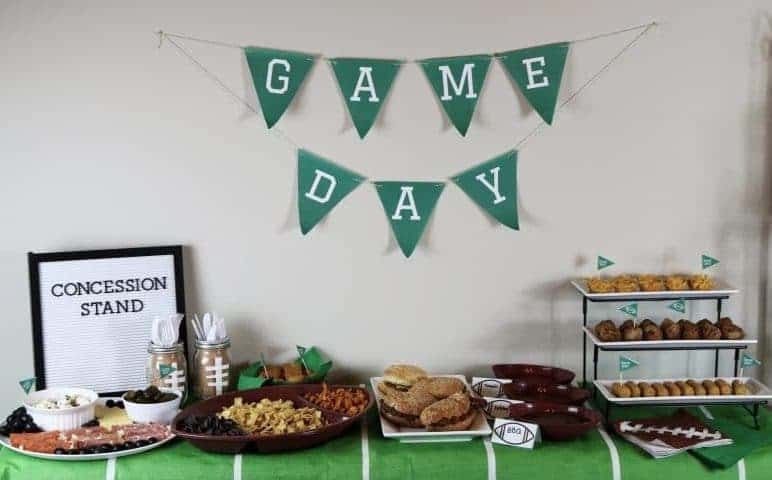 When it comes to decorating for your Big Game party, look for fun football-themed decor that is usually available during the weeks leading up to the Big Game. 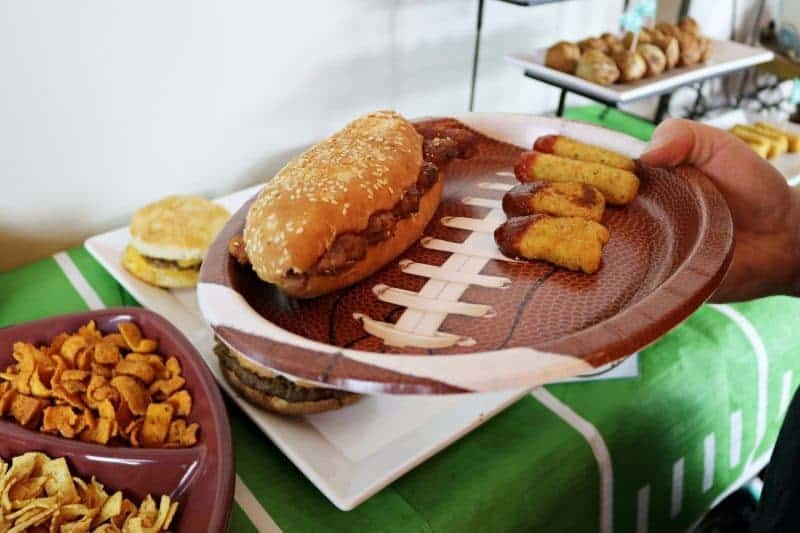 I picked up a large football-shaped serving platter, several smaller football shaped serving bowls, green plates and napkins, football plates and napkins, and a fun football field paper tablecloth. If you can't find any football specific partyware, you can just look out for green and/or brown items, which may be easier to find. Also, you can add fun little details like the ones you will find below. 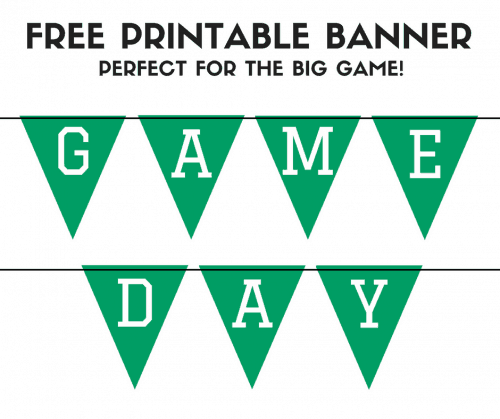 I designed a fun Game Day printable banner to hang above our party spread. 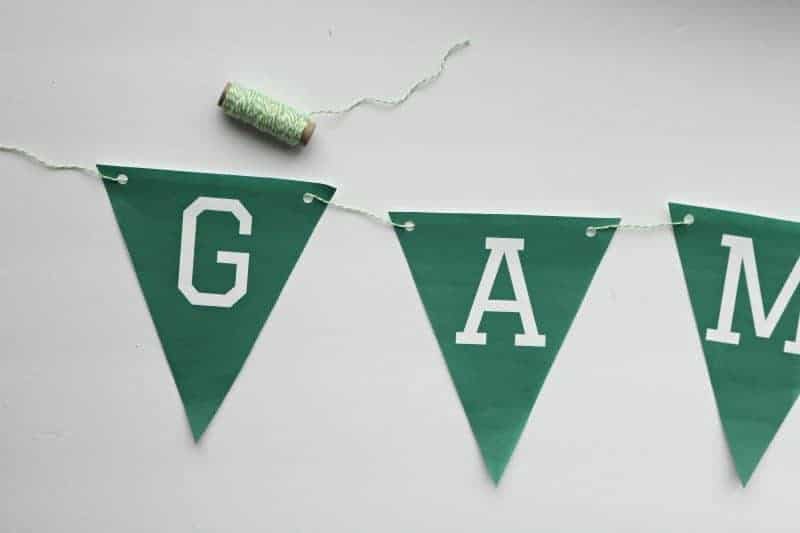 Follow the simple instructions below to make this fun DIY game day banner. 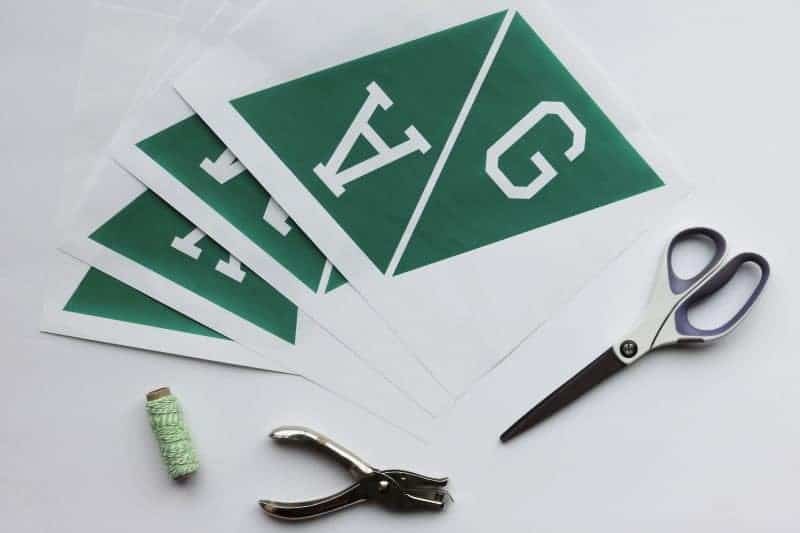 Cut out each triangle from the Game Day banner printable. Use a hole punch to make a hole near the top corners of each triangle. String the triangles onto twine. 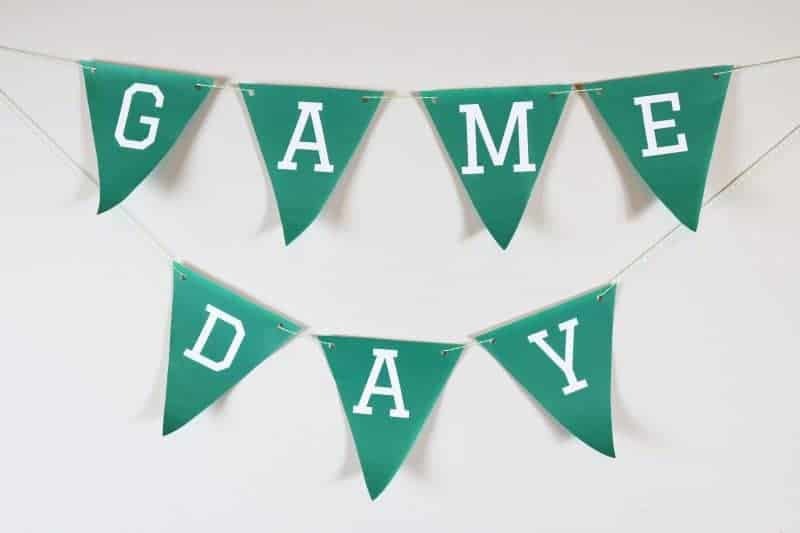 Hang Game Day banner on your wall using tape or thumb tacks. 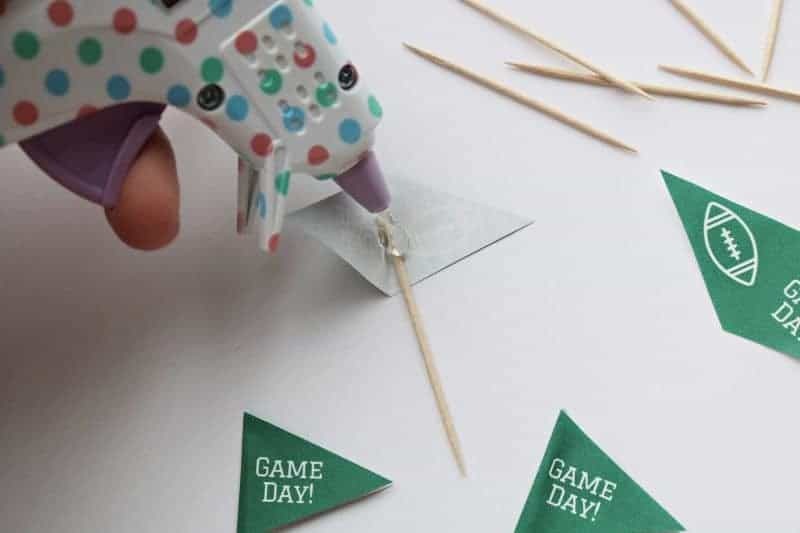 Spruce up your Big Game spread with these printable Game Day toothpick toppers. 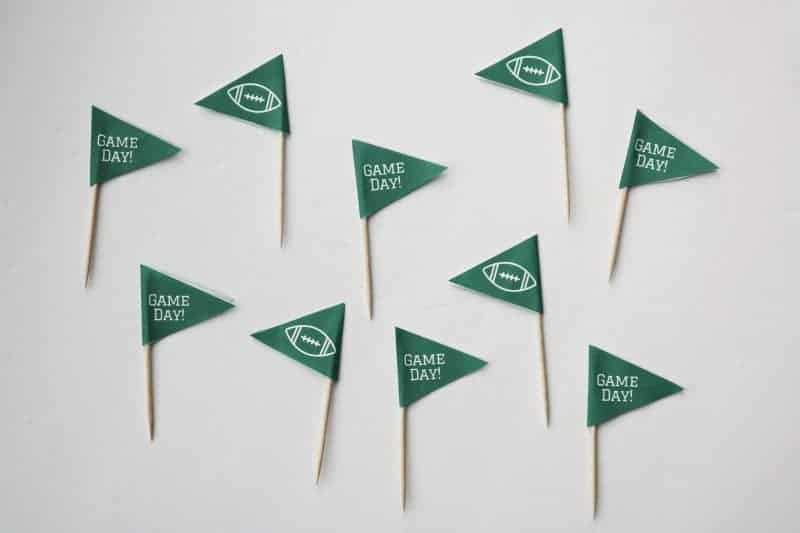 The little green flags read “Game Day” on one side, and feature a football design on the other side. These are super easy to make by following the instructions below. 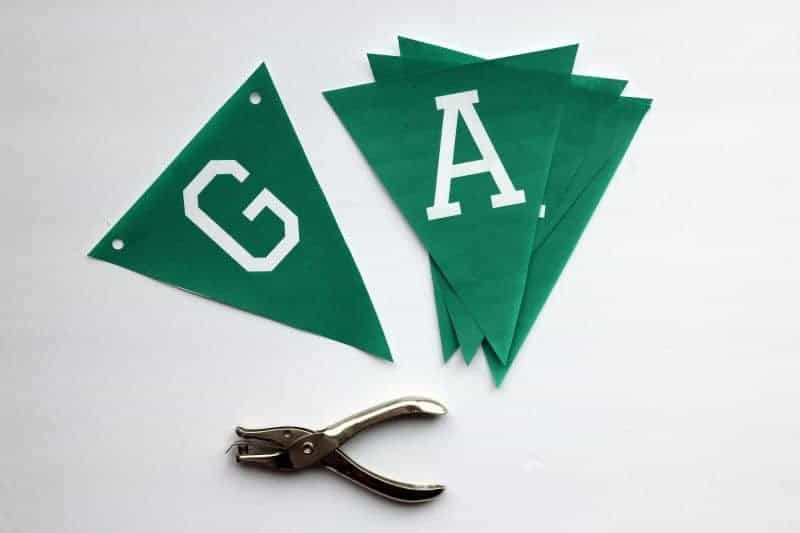 Cut out toothpick topper flags from the Game Day Toothpick Topper printable. 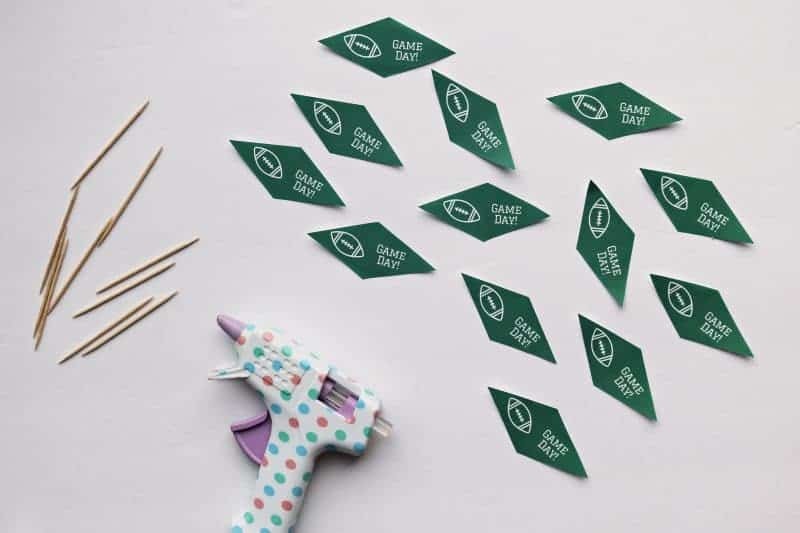 Fold flag along the center, open, and use hot glue to attach flag to top of toothpick. Repeat until you have topped all your toothpicks. These festive football themed mason jars were easy to make using masking tape and brown construction paper. They were perfect for placing utensils in out on the buffet table. Cut masking tape into strips and apply to mason jar to look like a football's stitching. Cut construction paper into a strip the height of the mason jar. Roll up, and place inside. 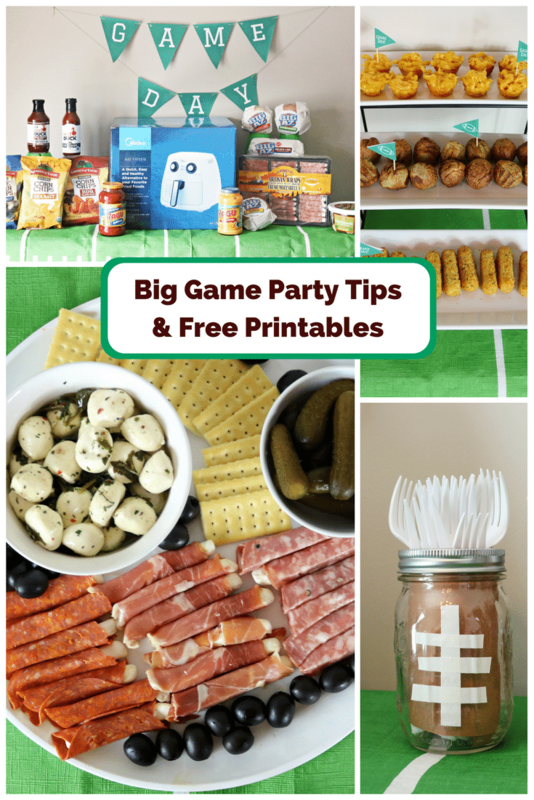 I hope that you enjoy these football-themed party tips, DIYs, and printables, and that you have a great time celebrating the Big Game this year. What are your tips for the Big Game?! 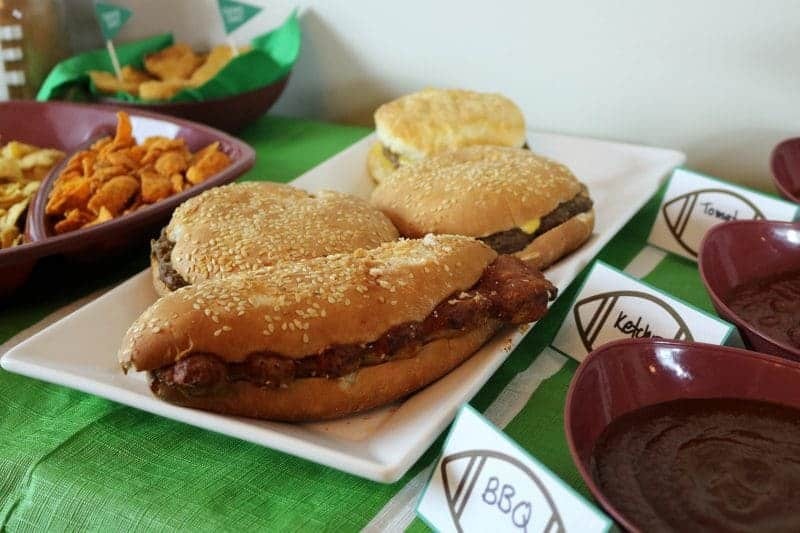 How about your favorite Game Day eats?! We would love to hear 'em in the comments below! 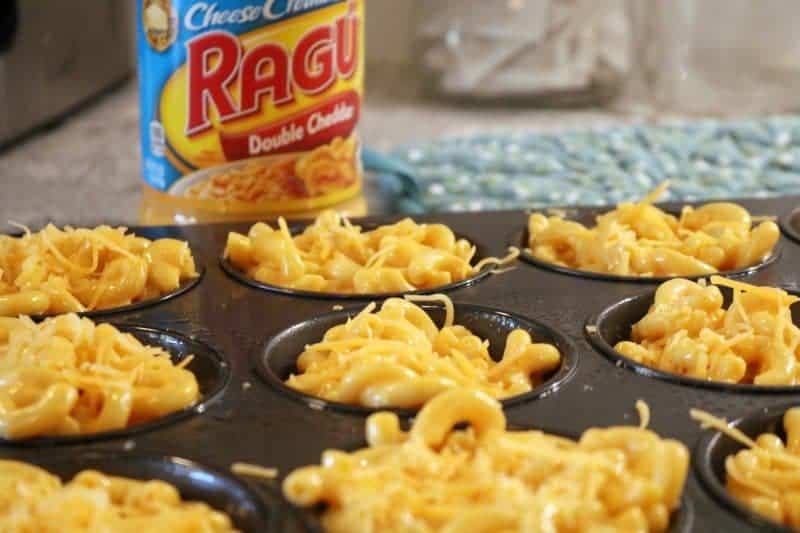 Cheesy and delicious mini macaroni & cheese cups are great as an appetizer or as a kid-friendly meal option. Prepare elbow macaroni according to instructions on package. Drain and return to pot. Melt butter in a medium sized skillet over medium heat. Whisk in flour, and cook while stirring for 1 minute. Whisk in milk, cooking while stirring for 1 additional minute. Remove from heat. Add egg and RAGÚ Double Cheddar Sauce to sauce mixture and stir to combine. Pour sauce over macaroni, and stir to mix well. Spoon into mini muffin tin, pressing down gently with back of spoon to make sure the macaroni and cheese fills out the cups. Then, sprinkle each cup with a bit of shredded cheddar cheese. Bake for 13-15 minutes at 400 degrees until top of mini mac and cheese "muffins" are golden. Enjoy! 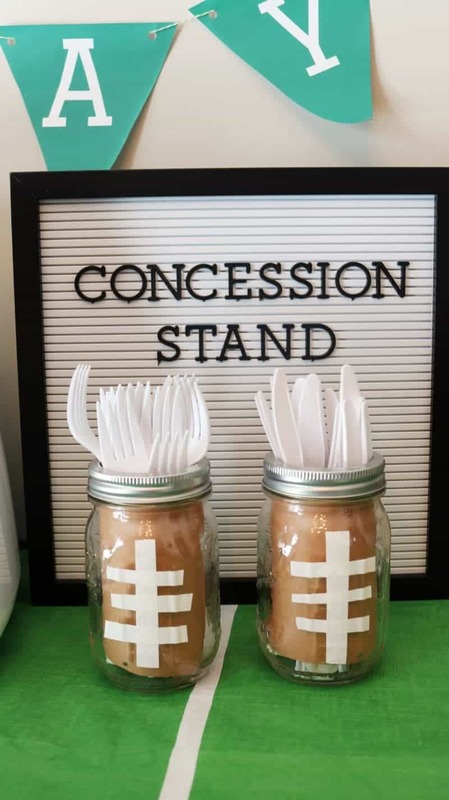 Your football themed party is so much fun! My guys would totally devour those mac and cheese cups. We are always looking for new snacks to enjoy on game day and this looks like a winner for this year! That’s a great set-up for a Football Party! I love those mac and cheese cups, my kids would LOVE them! Those meat rolls look delicious. I bet those burgers are yummy, I just checked and they are sold in my area. Yipppeee. Oh how I love me some football. Your decorations and food look wonderful. Wow… looks like you have everything planned perfectly for an amazing party. We aren’t huge sports fans but we do watch the big game, the commercials are sooo worth it. These printables really help you put the theme together, and now I have a perfect excuse for the air fryer. Amazing ideas for the game day, Jaclyn! Thanks for sharing!